The majority of my job responsibilities involve effectively communicating messages to internal, as opposed to external, audiences. When I’m not busy working on the redesign of the Judicial Branch’s employee intranet site, I’m usually working on one of the N.C. Administrative Office of the Courts’ employee newsletters. Check out examples of my newsletter work. I am the editor of the award-winning N.C. 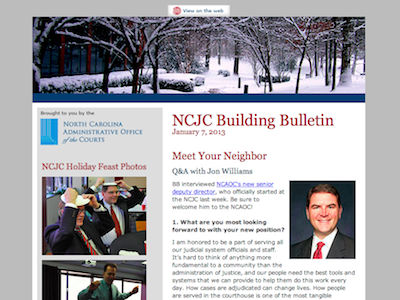 Judicial Center (NCJC) Building Bulletin, which reports on office news for the 400+ employees on our campus. The Building Bulletin has been my responsibility since June 2012, after a part-time resource dedicated to this newsletter left the organization. The newsletter has traditionally been sent monthly, but under my direction we’ve started sending updates at least twice each month. My role as editor is to generate content ideas, write and edit articles, take and edit photos, create graphics, and build the newsletter in HTML/CSS. We are currently in the process of implementing the GovDelivery email newsletter delivery service, but at this point everything is still done manually. I start with a yearly editorial calendar Excel spreadsheet, where I store content ideas for each month’s edition. We have a handful of recurring features — for instance, our Meet Your Neighbor staff feature and monthly photography contest — and some seasonal topics that we cover annually. NCJC staff can submit articles or ideas, and I’m also constantly thinking of new content based on what’s happening around the office. Our main goal is to share information and get staff involved in the office community. Once I have an idea of the content, I start building the newsletter as a webpage using an HTML/CSS template. Our former graphic designer created the branded template, and I’ve built on it over the past several months. I write new articles, edit audience-submitted content, design graphics in Adobe Photoshop CS6, take new or edit existing photos, create any surveys — and then drop them into the HTML code. It’s a time-consuming process, but HTML/CSS gives me the freedom to tweak the layout to my exact specifications. 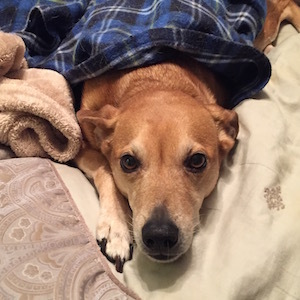 One of our internal developers created a program that generates photo gallery webpages from a list of image files, so I will run that program as needed, as well. Shortly before the publish date, I’ll send the finished newsletter file to my team members for review. Then, I’ll make any last-minute changes before uploading the newsletter files (the main HTML files as well as any images, PDFs, or photo galleries) to our FTP server. At this point, I check the newsletter URL in Internet Explorer, the official browser that all Judicial Branch employees use, for any strange behaviors. If everything looks good, I’ll send the newsletter webpage as an email via Outlook. Once we get GovDelivery up and running, the production of the newsletter will be a much simpler process. I’ll still be tasked with producing the right articles, images, and graphics, but building and sending the newsletter will be a more automated process. As a member of the N.C. 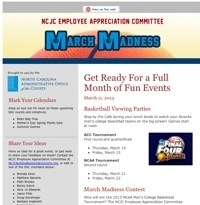 Judicial Center’s Employee Appreciation Committee (EAC), I help promote upcoming events and fundraisers — primarily through email newsletters and flyers — to the roughly 400 campus employees on an as-needed basis. The EAC newsletter currently follows the same production process as the NCJC Building Bulletin (outlined above), from which it also borrows its design template. I do create custom header banners for each issue, though. 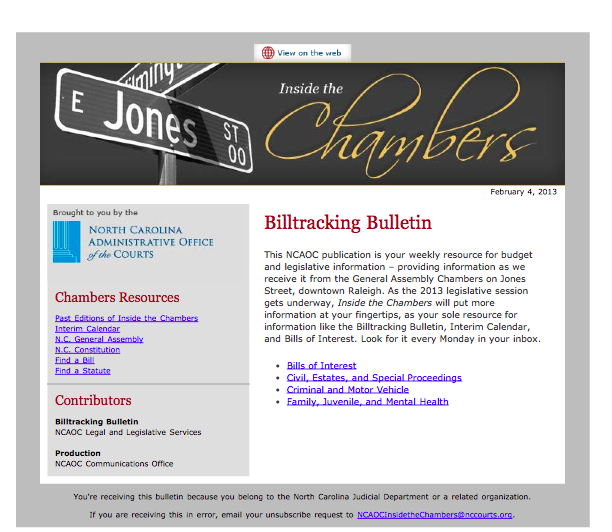 This newsletter, published weekly whenever the N.C. General Assembly is in session, provides relevant legislative updates to all 7,000+ employees of the N.C. Judicial Branch. When Inside the Chambers launched during the 2012 legislative short session, our former graphic designer based the HTML template on that of the Building Bulletin, but with a customized header banner. 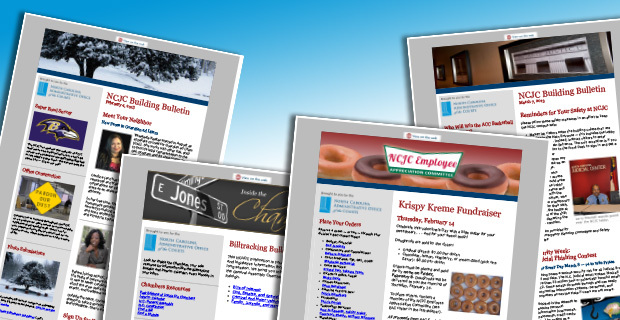 The newsletter started out with weekly commentary, budget news, and the latest legislation updates from our Legal and Legislative Services Division — but, in 2013 it evolved into a dedicated vehicle for disseminating legislation updates. This newsletter follows the same production process as the Building Bulletin, but it differs from the others in that I am not solely responsible for generating content. In this case, I’ve worked with our Legal team to define a standard process and schedule for submitting content so I can hit my publishing deadlines. As you can see, a lot of behind-the-scenes work goes into the creation of these newsletters. These are the three newsletters that I manage, but there are also others that I help edit or oversee each month. In addition to editing and production work, I’ve also worked with communications and technology staff to create guidelines and define procedures for Judicial Branch staff to follow when setting up additional newsletters. Newsletter work only comprises about 10-15% of my job, but it’s a chance to be creative, share interesting stories, and get others involved in company events and culture. Make sure you check out the rest of my newsletter work.